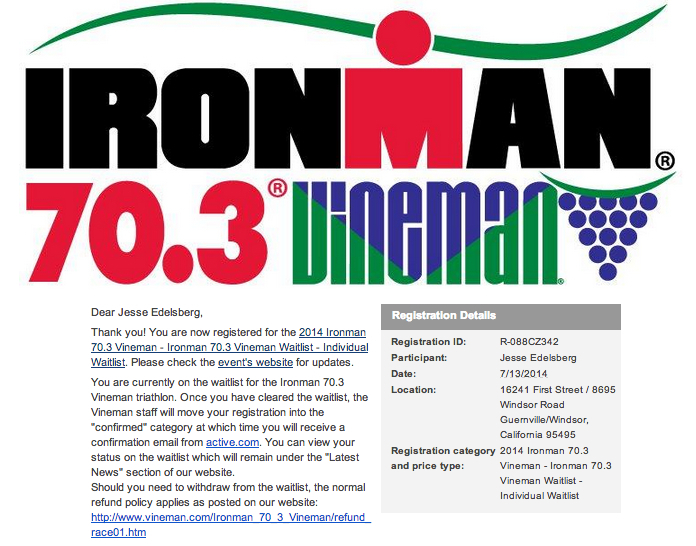 Vineman 70.3 historically sells out within minutes of registration opening. Between its wine country setting, prime mid-July race date, high volume of Bay Area participants, and pristine race course, it’s no wonder that triathletes travel from all corners of the world make Vineman their destination race of choice. Taylor and I have already booked a cottage only steps away from the swim start and planned our 2014 race schedules around Vineman being our A race. All that stood between us and Vineman was the dreaded active.com registration form. A computer, iPad and iPhone were not enough to make the registration a success – both Taylor and I received “registration ON HOLD” messages when we logged on at 9:00 sharp. After 30 straight minutes of pressing refresh, we were finally presented with a wait-list registration option, which we happily signed up for. With the exception of 2008, all wait-list registrants have been granted access to the race. It seems like all but a sure thing, but worst case, I already have my eyes on the Tahoe Rim 50K/50 miler the following weekend. Another option would be for us to race Kona Jr. – Ironman 70.3 Hawaii in June, but we’re optimistic that our A race will happen next July. Hi! just wanted to stop by your page. I saw you left a comment on Olive to Run’s blog about signing up for Vineman. I signed up for this year too and it’ll be my first half so I’ve been browsing blogs for tips on training. Read and enjoyed a few of your posts and looking forward to reading more. good luck on your races. Thank you! Looking forward to your training posts as well!